I have two girls who give me lots of practice buying good presents. I should probably thank them. She's brilliant, independent, curious, tenacious, and unbelievably creative. 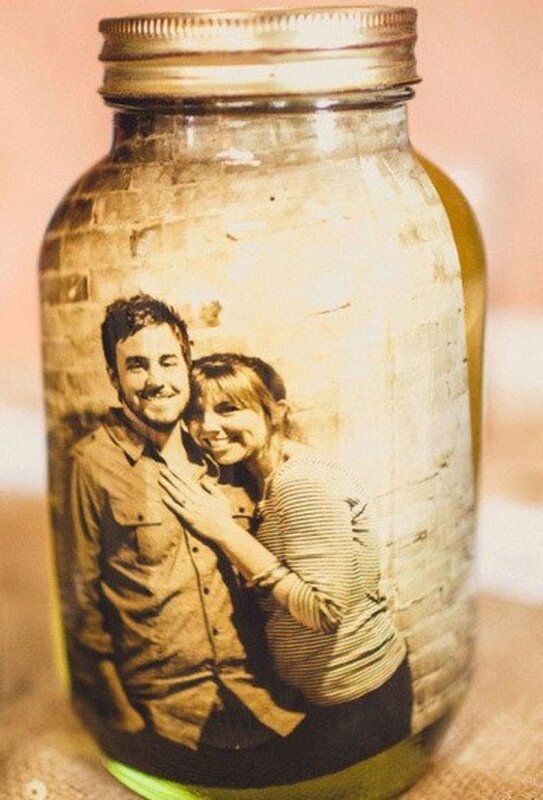 Buying a really great gift for this girl is not going to be easy, right? On the other hand, this is your chance to get her something fabulous. Don't waste money on some dumb ordinary thing she already has or won't ever use. Being a teenager is not easy, and these years are your last chance to take care of her, so give her something that truly reflects who she is and where she's going. Whether she's your daughter, granddaughter, niece, or just a special girl you care about, below you will find some beta-tested suggestions for the perfect gift. How do I know? Because I have two teen-y, tweeny daughters. Over the years, many of the gifts I gave them have been total duds, but I have started to figure out what they really want, which I share with you here. This is the first Rookie Yearbook: There are three others! They are non-sequential and can be read out of order. My daughter has dogeared and drooled over the first three Rookies already, and I can't wait to see her face when she opens her present and sees Rookie IV. 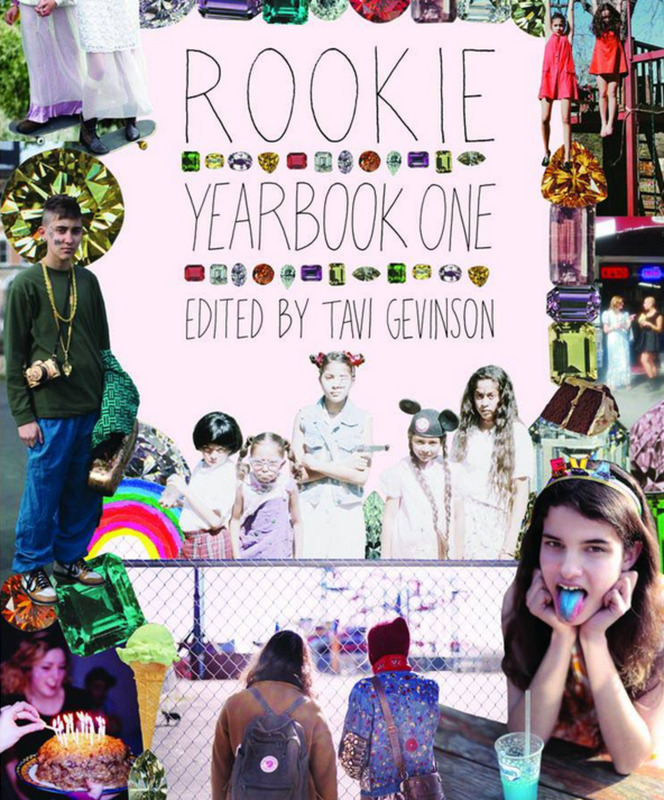 Tavi Gevinson, the editor who put these books together, is one cool kid. When she was 11 years old, she launched a blog called Style Rookie which became an online magazine called Rookie Magazine which quickly attracted interest—over a million page views in less than a week after launching— so much interest, in fact, that her best pieces were collected and published in paper as The Rookie Yearbook I, full of smart, engaged, and engaging articles and interviews and interviews by Tavi, staff writers, Rookie readers, and various figures from pop culture. Rookie is like the teen magazines of my youth, except it's written by smart people who really get it, so it's fifty times more creative, thoughtful, and inspiring. 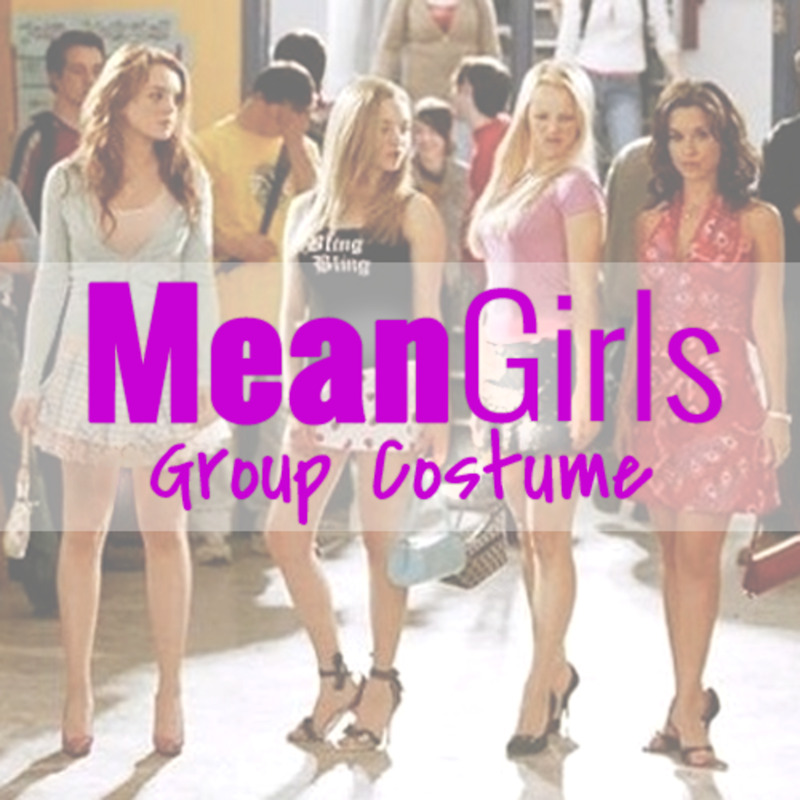 Mostly, it helps girls and young women recognize themselves and reconcile that self with society's expectations. 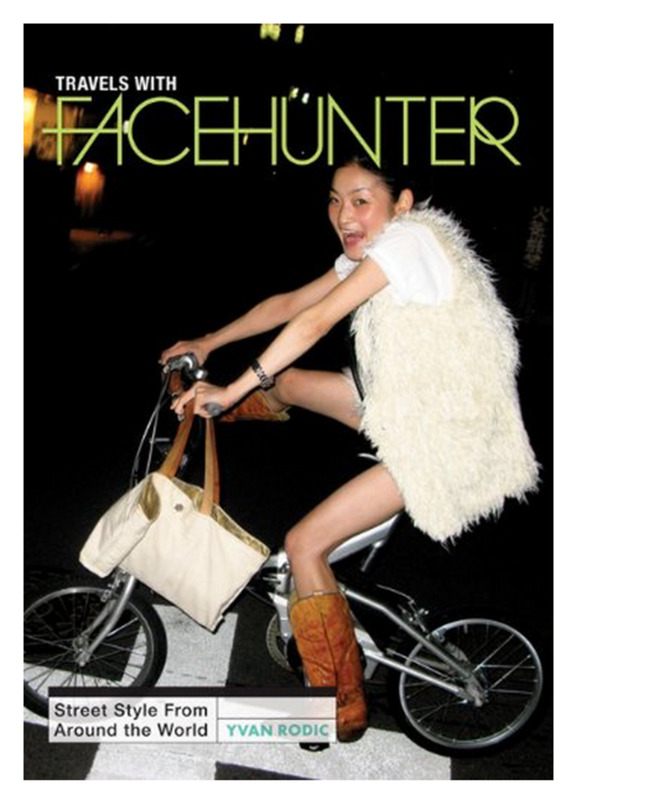 "An exciting first exposure to this new brand of young, girl-power feminist journalism." 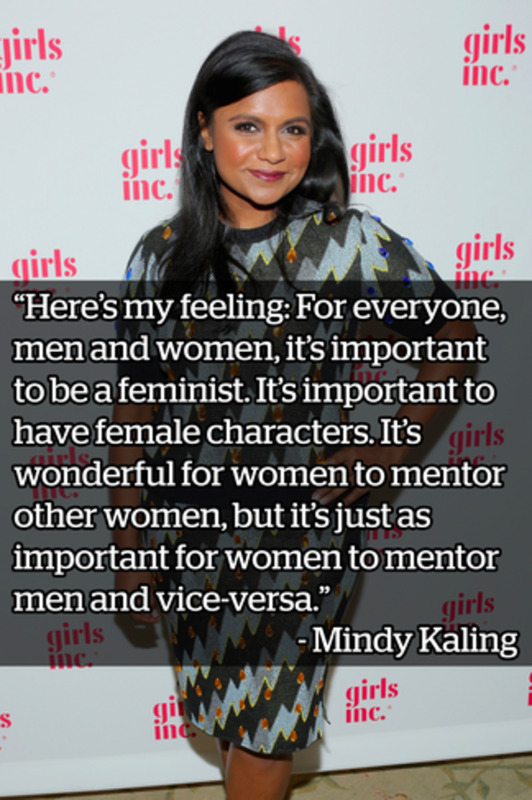 See Tavi's TedTalk on What Makes a Strong Female Character. If you follow this link to Amazon, you'll find the other Rookies, too (but you don't have to read these in order!). Rookie I includes contributors like Daniel Clowes, Lena Dunham, Miranda July, David Sedaris, Sarah Silverman, John Waters, and Joss Whedon. Rookie II includes Mindy Kaling, Judy Blume, Grimes, Morrissey, Molly Ringwald, Emma Watson, and Lena Dunham, while Rookie III includes Sofia Coppola, Kim Gordon, Lorde, and Sia. While you're there, I suggest you read the reviews. Maybe she walks around with earbuds in her ears all day long, or maybe she's already taken up an instrument, but if your girl is into music then perhaps she'd love to fiddle around with a new instrument. We have electric and acoustic guitars, a keyboard, trumpet, and an accordion, and whenever I hear music leaking out from under a closed door, I am thrilled. If she already plays an acoustic guitar, maybe she'd like to plink on a ukulele or plug into an amp. If she likes wind instruments, she might also enjoy playing around with a harmonica or a trumpet. Get her a digital piano or a synthesizer and let her try her hand at that. 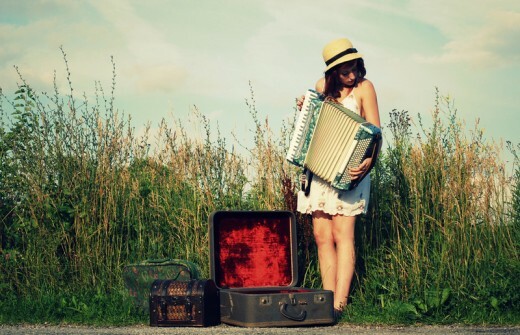 Don't forget the oddball instruments like bagpipes or a stylophone or hand harps: I saw a used accordion on Ebay for $40! Amanda Palmer Loves Her Ukelele! A book is the best present you can give someone. As Oscar Wilde said, “It is what you read when you don't have to that determines what you will be when you can't help it.” Giving someone a book is inviting them into a fascinating dialogue. Is it just me, or are teachers not assigning the really great, important books? Maybe it's our responsibility to introduce our girls to the books that stuck with us, the ones that made us feel and think something big. When I give my daughters books, I try to find a beautiful used hardback. I write a dedication on the inside cover: Sometimes I include my favorite quote from that book as a little teaser, sometimes I tell her why this book was important to me and why I think she'll think so, too. 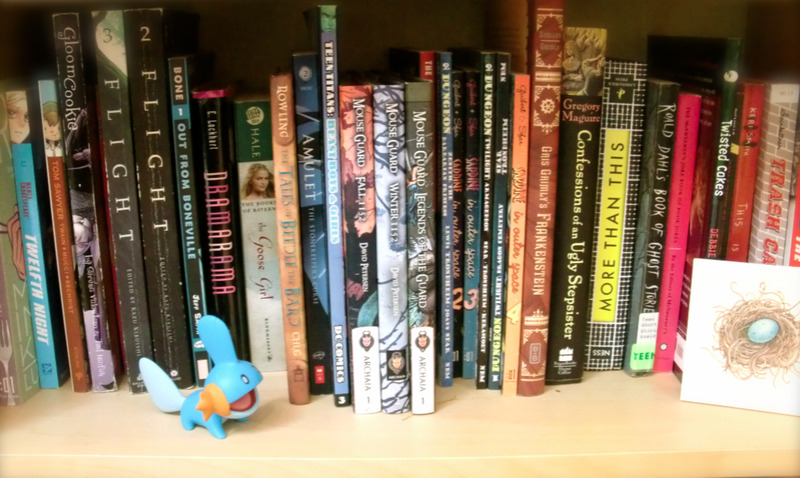 A girl always has room for more books. My daughters adore these manga graphic novels (Hamlet, Romeo & Juliet, King Lear, etc. ), which are good "gateway" books to get your kid hooked on Shakespeare. They will also appeal to and increase understanding of anyone who's already read the plays. They use a lot of Shakespeare's language and employ a dramatic, passionate visual style that appeals to a teenager's emotions. These interpretations add to the intelligence and beauty of the plays. Every girl should read this book. It's a dystopian fable of the near future: In the Republic of Gilead (formerly the US), ideals have been carried to extremes, resulting in a society that has become a nightmare: women (most of whom have been rendered infertile by pollution) are strictly controlled, unable to hold jobs or money, and assigned to one of three classes: wives, housekeepers, or handmaids (the only ones who can still have babies, who must turn their offspring over to the ruling households). These games are fun ways to give your brain a workout. She's not too old to play games, and if they're fun enough, she might even play them with you. It may feel like she's pulling away these days but these games are an excellent excuse to hang out together as a family. Dixit is a deceptively simple and gorgeous game that will appeal to people from age 8 up. My youngest daughter got it on her 8th birthday and our whole family got hooked. My daughter is designing her own deck. The game is played with a gorgeous artist-drawn deck of cards, each one depicting a different symbolic scene and will appeal to anyone with even a little imagination. The rules are easy to follow, and it only takes about a half an hour to finish. You need at least three people to play. Qwirkle is a bag full of wooden tiles: each is one of the six different shapes in one of six different colors. It's sort of like a cross between poker and dominoes in that you can play rows of all one color or shape, but this game also allows tactical maneuvers and well-planned strategy. (Winner of the Parent's Choice Gold Award and a Mensa Select National Competition.) This is another game the whole family can play: Requires two to four players ages 6 and up. Say Anything Every player answers a question like, "What's the most important invention of the past century?" or “What would be the coolest thing to teach a monkey?" Then players try to figure out which answer the judge will like best. Some people are really good at talking, and it's fun to discover and develop a talent for this game. Dixit is an award-winning, stunningly illustrated game of creative guesswork. Players use the beautiful imagery on their cards to bluff their opponents and guess which image illustrates the story. Guessing right is only half the trick— to win, you have to convince your friends that your card tells the story best! Help her figure out which colors look best on her and then take her shopping to buy an item in a new color she's never worn before. Take her to a big department store to get properly fitted for a bra. Buy her one in any style she chooses. I saw these bracelets in a fancy catalogue for almost $200. Even if I were filthy rich, it wouldn't feel right to spend that much on a bracelet. 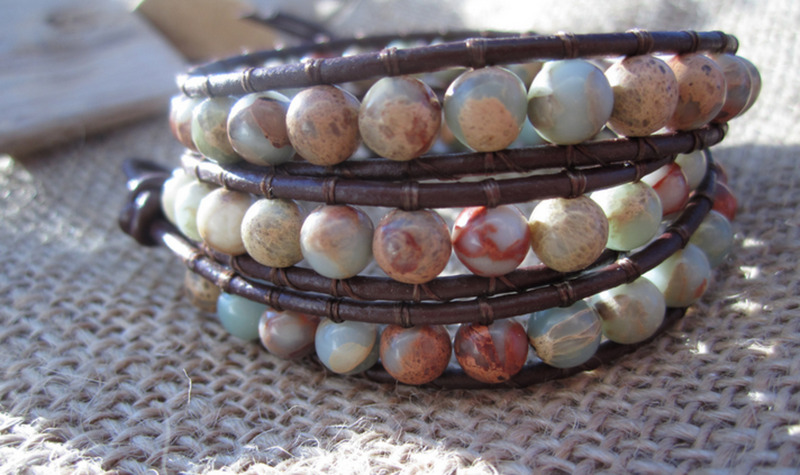 But then I went online and typed in the search terms "gem," "leather," "wrap," and "bracelet" and found a huge array of choices for less than $20—some with metallic beads, others with agates, turquoise, crystals, and other stones—a color and style to suit almost any teenaged girl. What my daughter likes about these is that they are handmade of natural materials and feel significant on her wrist when she's wearing them. Try Etsy or Ebay. Road trip. Find something she's interested in within driving distance and go for it. 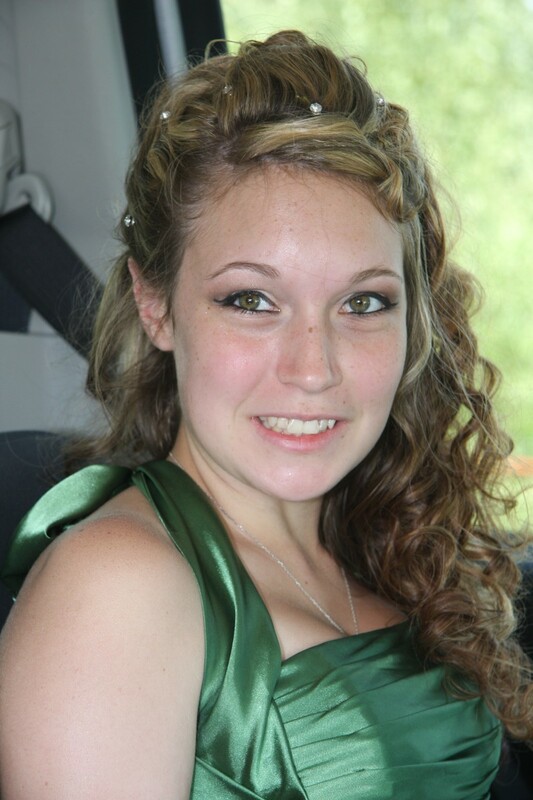 If she's got her license (or a learner's permit), let her drive half the time, and take turns choosing the music. Movie marathon. My daughters and I love old or black-and-white movies: All About Eve, Breakfast at Tiffany's, Sunset Boulevard, Whatever Happened to Baby Jane, Gone With the Wind, West Side Story, Some Like it Hot, and Rebel Without a Cause. They loved Amelie, Whip It, and The Unbreakable Kimmie Schmidt. You could also watch the movies you loved when you were her age. 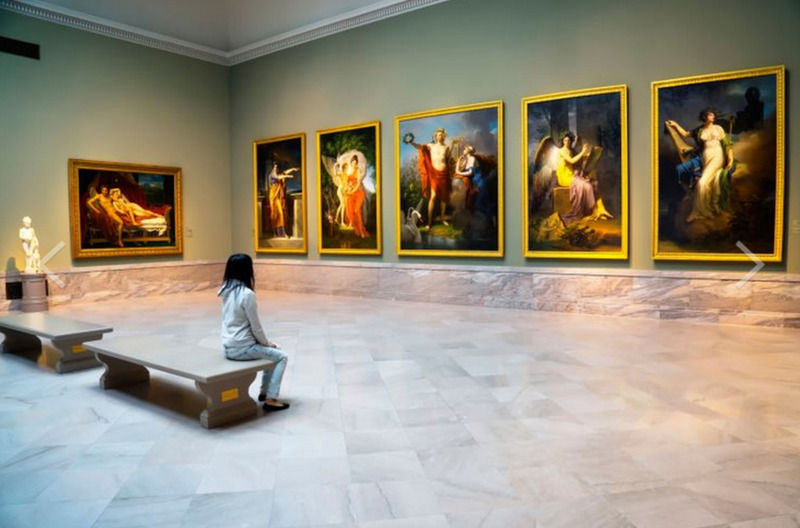 Art museum. If you're lucky enough to live near an art museum, take her! Sometimes it's even more fun if you make it a game: make up a story about the art or the circumstances under which it was made. Name the people in the paintings. In each room, pick out your favorite piece. Concert or play. I tend to forget how fun plays and concerts are, but when I happen to remember to get us tickets for something, it's always memorable. The other day we went to see a local production of Hairspray! Walk/Hike. Bring a picnic and find a spot with a wide view. Or if you're urban, plan a walking tour of the city. Get a map and have fun planning it out. (Sometimes I bring a camera and instead of calling it a hike, I tell her we're going on a photo safari, which sounds more enticing for some reason). This is the set I had as a kid: Twelve gorgeous, velvety, jewel-toned colors that layer on in delicate, transparent layers so you can create areas of color that are anything from watery to completely saturated with color. You can even experiment with color by mixing these together. You can use them with a brush or with a dip (calligraphy) pen. Pots of Ink. When I was young, my mom splurged on a set of Windsor & Newton inks for me, and I'll never forget it. 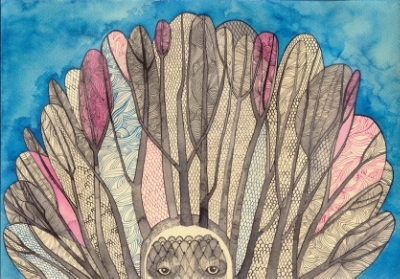 I spent hours playing with those inks and my daughters do the same. You can use them for fine line drawings or with a brush for a watercolory effect. Calligraphy Set. If she likes to write poetry or letters or notes to her friends, a calligraphy set is a great gift idea. There are two kinds of pens: the old-fashioned kind with a pen and an array of different-shaped nibs she'll dip into pots of ink, or a new-fangled kind that has little cartridges of ink. They're both good, but it's easier to switch colors with the old types and there's less plastic. If she's a romantic soul, consider getting her one of those grand ostrich-feather pens to dip into the ink. 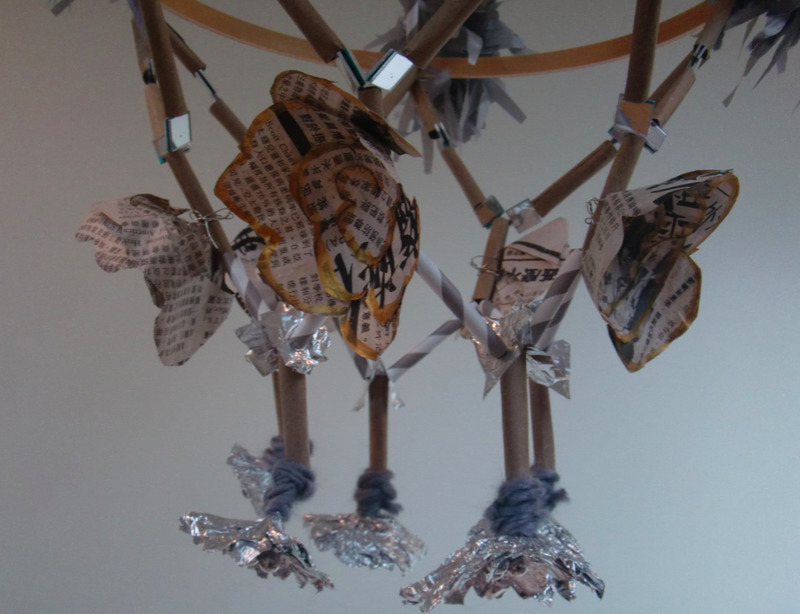 Origami Papers. Yes, there are a million how-to videos on YouTube for how to fold origami mushrooms, unicorns, or beetles. But these beautiful squares of paper are not just for origami, after all. She can make cards or do collage. I keep a full drawer of origami paper at all times, in case of emergency. Photograph-Coloring Pens. Yes, you can play with photos digitally these days, but it's also fun to work with real photos and real ink. These photo-safe tones make an artistic photo pop. Once you see what she can do with these pens, you'll have a new appreciation for photography. 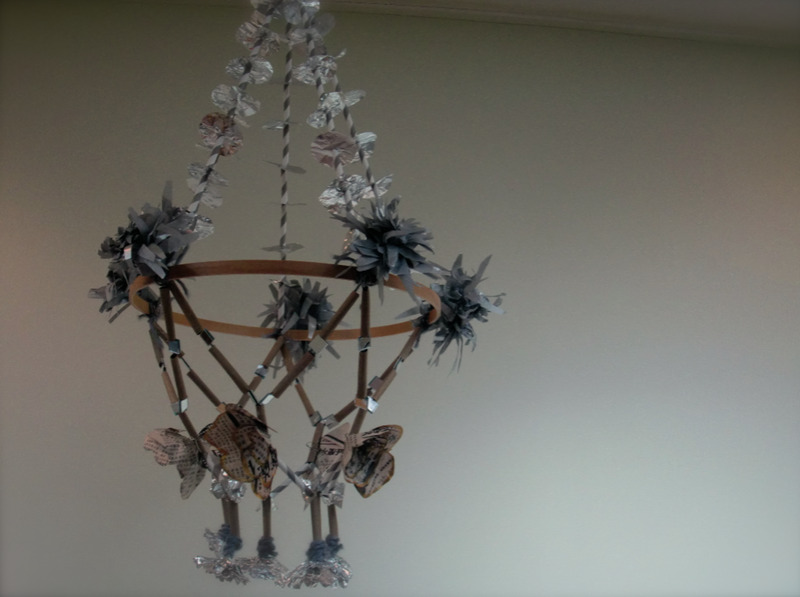 The surprisingly elegant chandelier my daughter and I made of tin foil, newspapers, paper straws, mirrors, yarn, tissue paper, twine, and part of an embroidery hoop. Detail of the bottom. We used a Chinese newspaper. 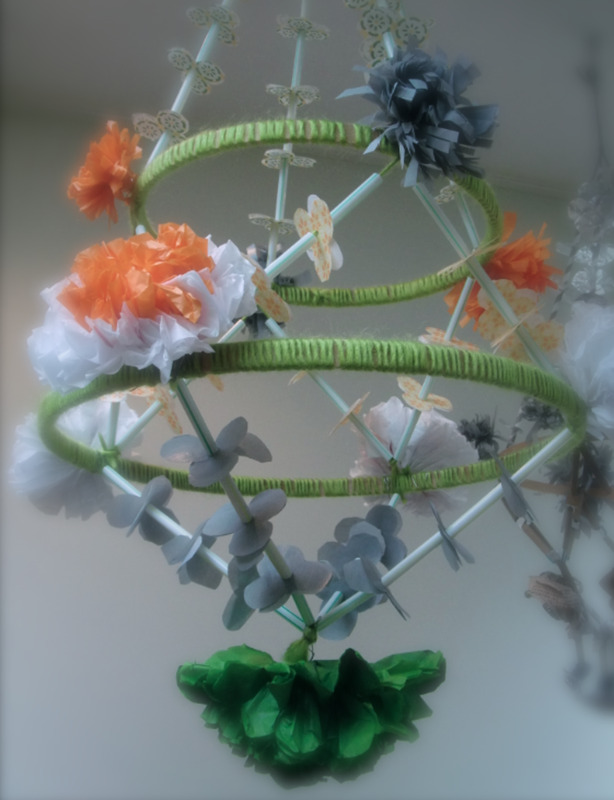 Another chandelier we made, this one more colorful. 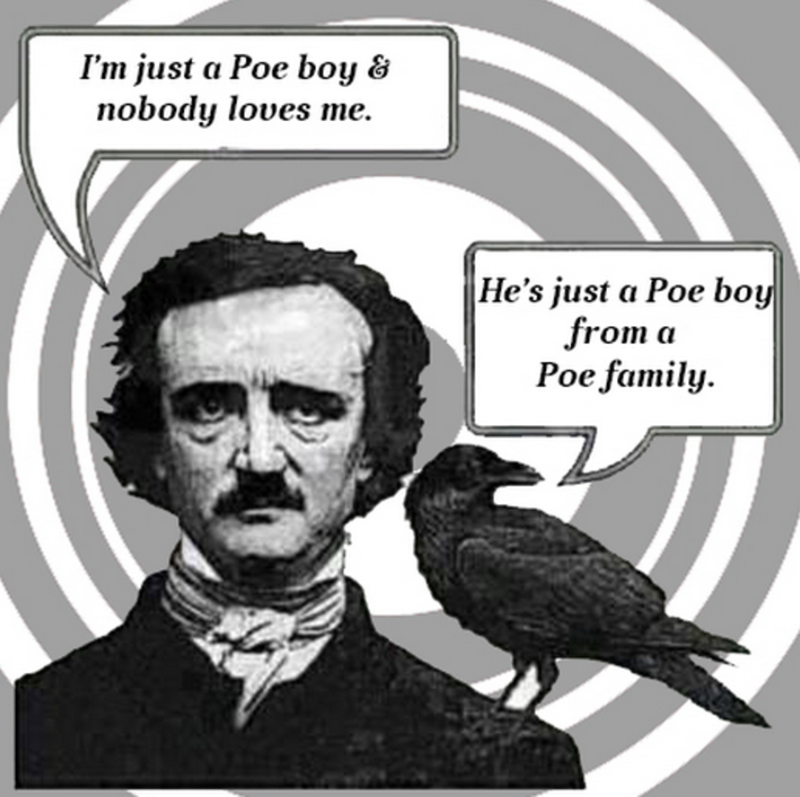 She'll get the joke if she's heard Queen's "Bohemian Rhapsody." She can carry her lunch, books, art supplies, gym clothes, and sleep-over stuff. Search "literary" and "book" and "bag" online and you'll find many choices. I found one that said, "Literary Rebel: I Read Past My Bedtime"
I'm Not Strong for a Girl. I'm Just Strong. I also found t-shirts with pictures of Beyonce, Virginia Woolf, Frida Kahlo, Dorothy Parker, Audre Lorde, Rosie the Riveter, the Go-Go's, Heart, the Dixie Chicks, and the feminist power symbol. 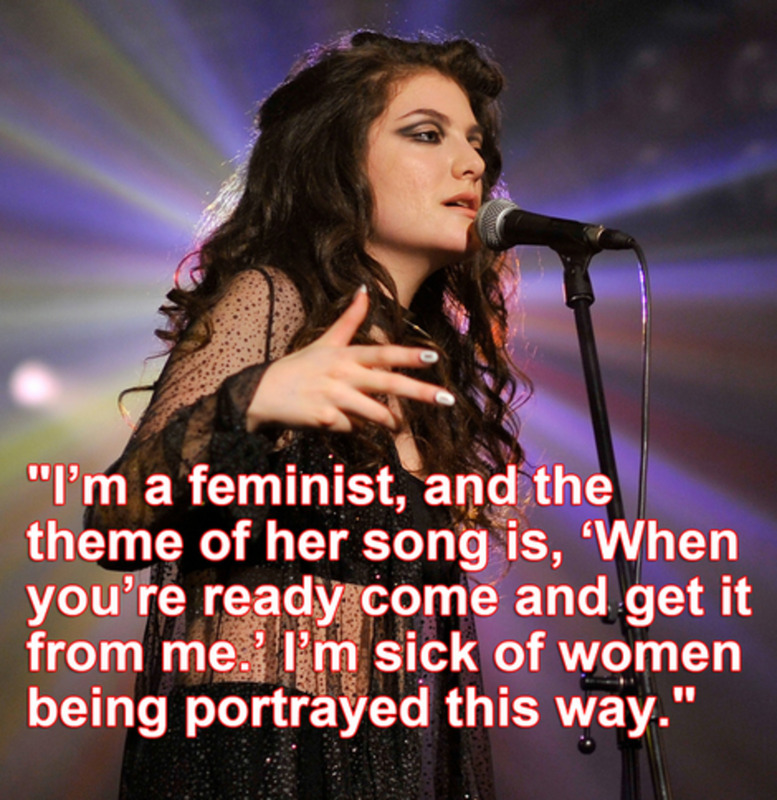 Why feminist gifts, you might ask. 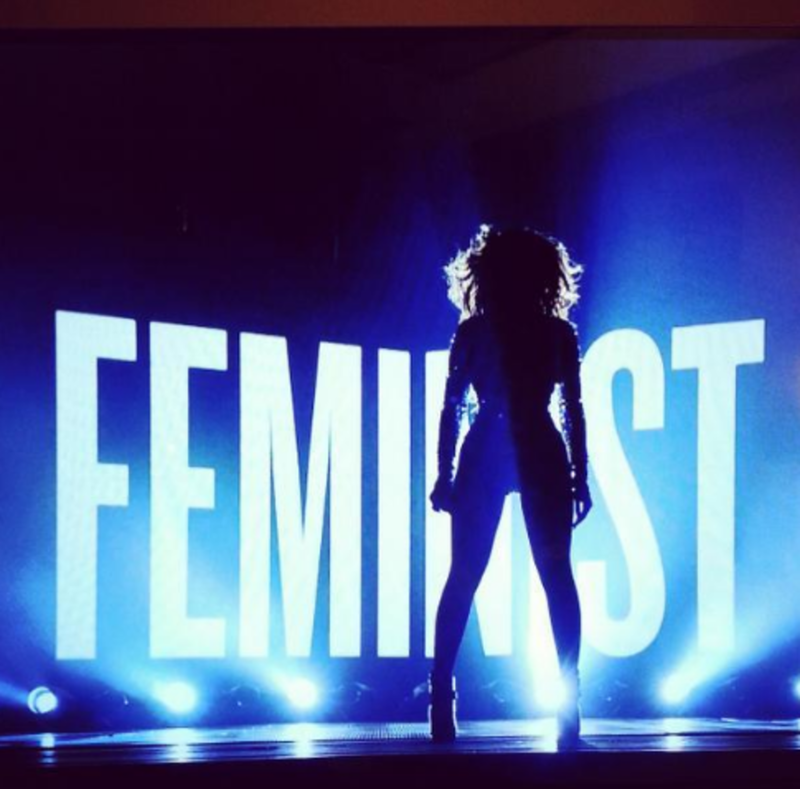 Not just because feminism is experiencing a renaissance—thanks in part to women like Beyonce, Emma Watson, Lorde, Mindy Kaling, Jennifer Lawrence, and even Taylor Swift, who are reminding people what feminism is, and that it's about political, social, and economic equality—but because the longer feminism stays in vogue, it more it will benefit everyone. 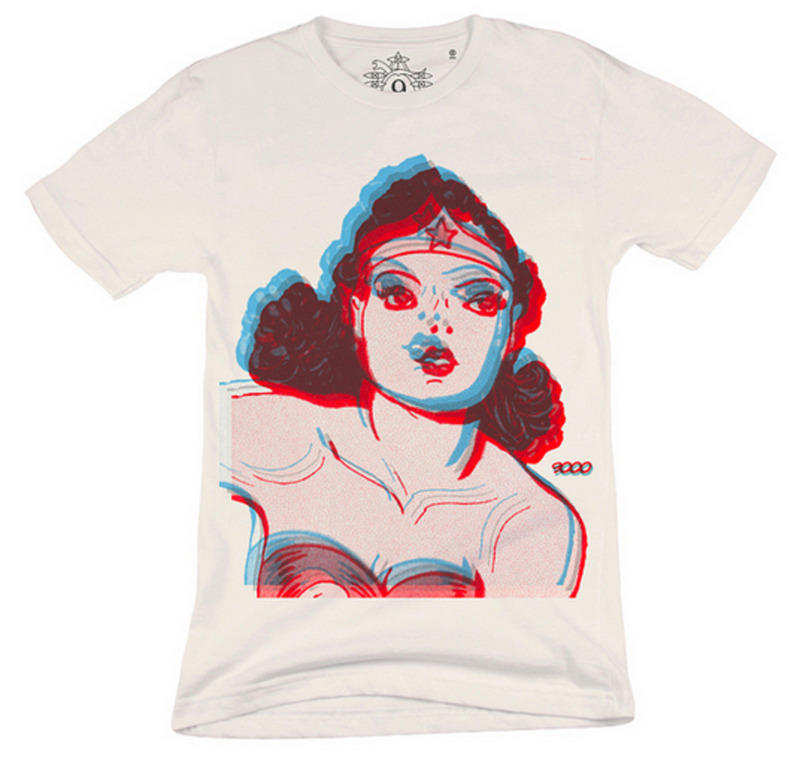 Yes, it's true that feminism is cool, but that's not the reason you buy the t-shirt. You give her the t-shirt (or the books or the electric guitar) because they remind her she's unique and important, she's a special snowflake, and the world where "feminist" is a good word is the world you want your girl to live in. 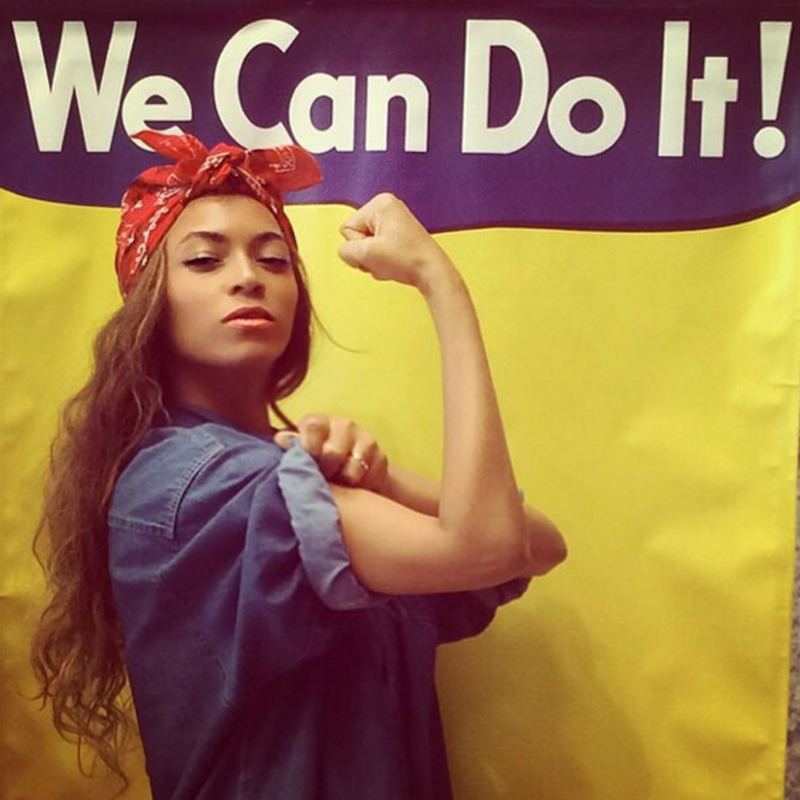 Beyonce, in a Rosie the Riveter homage she tweeted to fans. 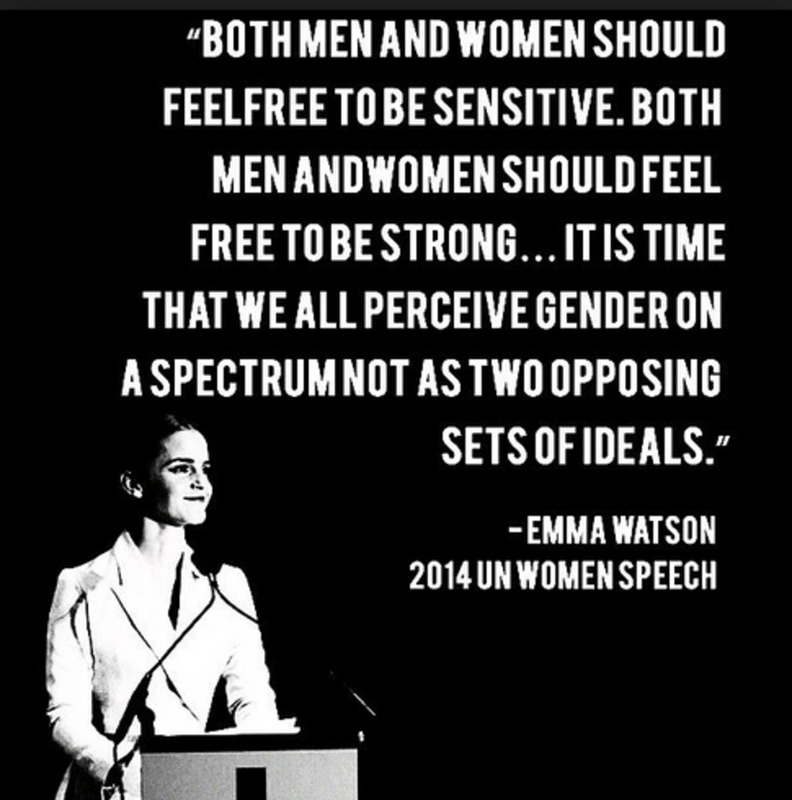 Emma Watson, in her speech for the U.N. in which she invited all men to join the fight for equal rights. Taylor Swift in an interview with The Guardian. 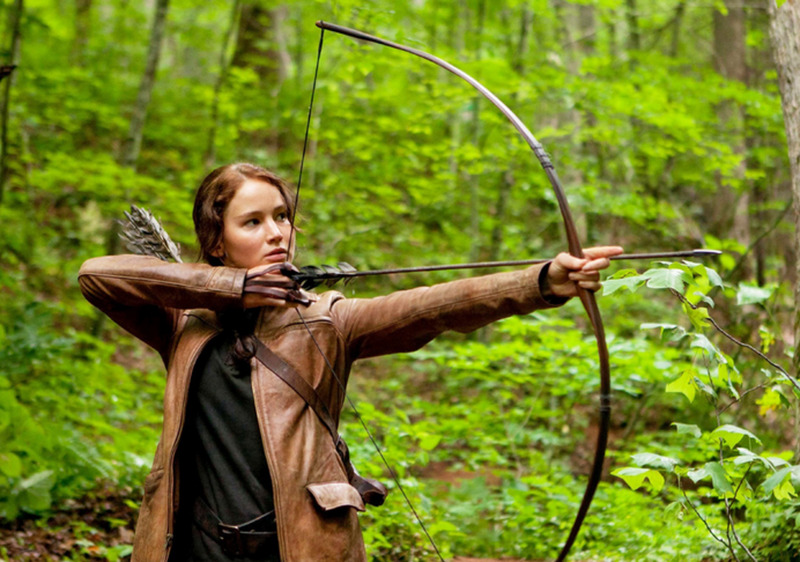 Katniss Everdeen hunting for dinner (in The Hunger Games). 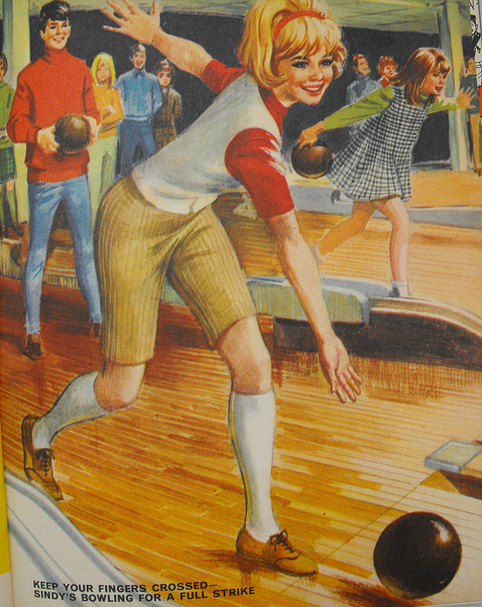 What About Precocious Middle-School-Aged Girls, Tweens, and Nostalgic College Students? 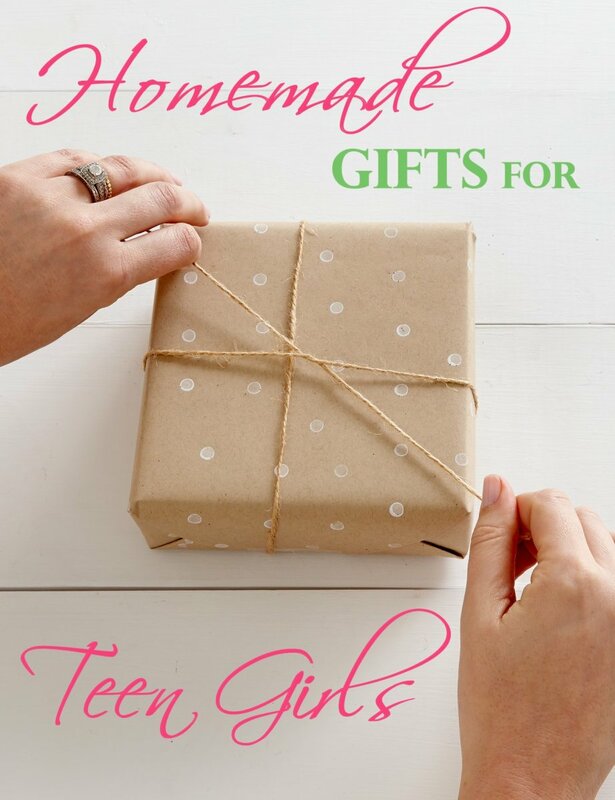 Although I wrote this article for teenagers, the gifts described here might also appeal to a much wider range of ages. 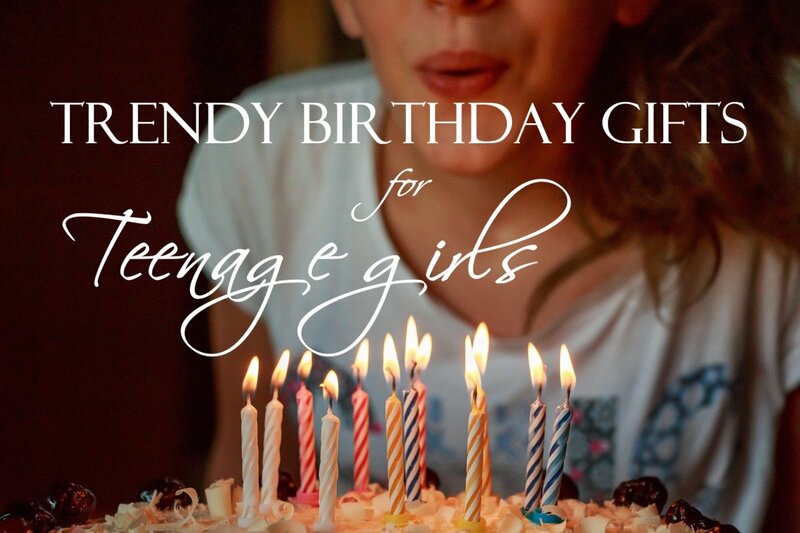 Some of these gifts are completely appropriate for your precocious 10-year-old, tween, or even a young college student. What kind of teenage girl are you shopping for? My girl is the creative type. Anything crafty will appeal to her. She's musical. I think I'll choose a gift that lets her explore music. She's into words. A t-shirt, books, pens, or book bag would suit her well. She's ready for a bigger perspective. I think a road trip or some other activity might be in order. She's all of these things. Any one of these gifts will make her happy! I wish I knew. I have a sinking suspicion that she won't want any of the things on this list. Category 'an experience' always works for my daughters. Usually, I plan what they are interested in then. Once it was horse riding lessons, another time I took them ona a trip out of town to admire the meteor shower. I also bought them a real star from heaven! Both got a certificate from the Kingdom of Universe. Now they are owner of the star named after them. Wow, this is a really incredible gift guide. I'm loving this. I'm not shopping for a teenage girl this year (though sometimes it feels like my seven-year-old is fourteen already) but these gifts are actually super unique and well thought out. Thanks so much for this page. After looking through lots of crap gift ideas, this gave me tons! I love your ideas and you have beautiful photography! My 3 girls have not yet reached their teen years, but they like making art and crafts, including bracelets. They also like music and playing some instruments. I think next time I shop for gifts, I will also check out the 3 game gifts you listed. I'm sure they will like playing these type of games, too. Thanks for the many gift ideas for girls here. 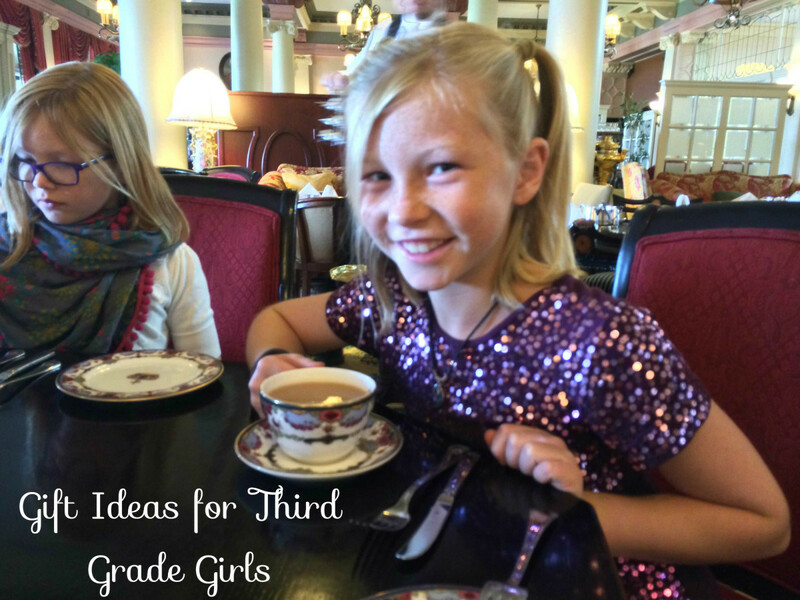 Lots of great ideas here. I really like the idea about games and experiences. I have 4 daughters and one of them loves theater so for the last two years I've gotten season tickets for us to our local civic theater and to the local University theater. Although we don't make every play, and a few haven't been appropriate for a young teen, we generally really enjoy ourselves and are creating memories together. I LOVE this hub! You've covered just about everything in such an easy to read, fun article. I love the ideas, and your list of books is so interesting I'm going to look into reading some of them myself! Thanks for sharing so many great ideas! I think 'experiences' are wonderful gifts even for younger kids. It helps them understand life isn't just about material things. Your girls are fortunate to have a savvy, smart mom.